Monfalcone Shipyard Shut For Almost A Week – Other Cruise News: A New Ship For Hurtigruten – Crystal’s New Expedition Ship? Last week saw the closure of Fincantieri’s main shipyard at Monfalcone due to a court order seizing certain portions of the yard used to store waste products. 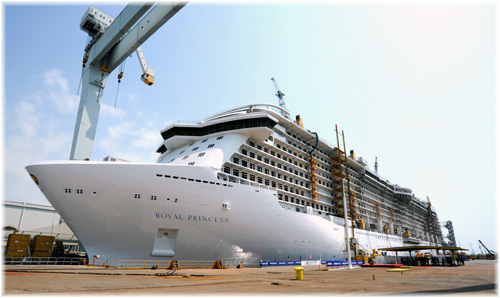 A government decree was then passed on Friday so that work can recommence at the yard, which is building two large cruise ships for Carnival and Princess plus the first of its new Seaside class for MSC. Meanwhile, Hurtigruten has acquired a passenger vessel in Portugal that it intends to convert to an expedition ship and unconfirmed rumours from Singapore have Star Cruises’ luxury small ship Megastar Taurus about to join the Crystal fleet. Last Thursday, June 30, Fincantieri announced that an order issued by the Court of Gorizia on behalf of one the local environmental police (Nucleo Operativo Ecologico dei Carabinieri) had forced the preventive seizure of some parts of its Monfalcone shipyard. These were areas intended for the storage of waste that are crucial for the overall running of the yard’s production processes. The seizure is part of an investigation initiated in May 2013 that had been rejected by the preliminary investigating judge at Gorizia, a rejection that was sustained by the Gorizia Court on appeal. Following a subsequent appeal to the Supreme Court by the Gorizia Public Prosecutor, however, the seizure was effected as a precautionary measure. Seven individuals, including a former shipyard manager and subcontractors operating at the site, are being investigated for illegal waste management. The order last week meant that Fincantieri was forced to suspend work and lay off all workers involved in production at the Monfalcone yard. Kept outside the gates on Wednesday were 1,500 direct employees of Fincantieri plus workers for their subcontractors. In addition, all truck deliveries of materiel and ship components to the yard had to be stopped. On Wednesday, July 1, the gates were re-opened only long enough to allow access to 150 office and maintenance workers. Production employees were meanwhile the subject of an application prepared by Fincantieri for unemployment benefits for the time lost. The huge Monfalcone shipyard is the centre of the Fincantieri group, which also includes shipyards at Venice, Trieste, Genoa and Ancona that produce cruise ships, as well as other yards devoted to naval work. The Monfalcone shipyard employs around 4,500 people, of whom over 1,500 are direct Fincantieri employees, with the remainder working for sub-contractors. Fincantieri buys goods, materials, services worth €1.5 billion from about 3,000 enterprises across Italy. Of this turnover, 20%, amounting to over €300 million, covers about 400 firms in the region around Monfalcone. On Friday, July 3, the Italian Government finally issued a decree allowing the reopening of the Monfalcone yard but work will not be restarted immediately. Today group ceo Giuseppe Bono submitted a request for release from the seizure to the judges of the Court of Gorizia that has now been accepted. Tomorrow or in the next few days the seals will be removed and only then will production resume. Currently under construction at Monfalcone are the 3,954-berth 133,500-ton Carnival Vista, due for delivery in April 2016, a 3,560-berth 143,000-ton unit of the Royal Princess class for Princess Cruises, for delivery in the summer of 2017 and the 4,140-ton 154,000-ton MSC Seaside, which is due to enter the Miami-Caribbean trade at the end of 2017. Other Fincantieri production includes ships for Holland America and Seabourn at the Marghera yard, near Venice, the Seven Seas Explorer for Regent Seven Seas at Sestri Ponente, near Genoa, and smaller ships such as those of Viking Cruises and Ponant at Ancona. Hurtigruten announced last week that it has purchased the 74-berth 7,025-ton Atlantida. This ship was built in Portugal in 2009 for inter-island service in the Azores, but never placed into service. This week she will leave Portugal for Norway and an extensive rebuild, to fit her for service in both Hurtigruten’s scheduled coastal line and in expedition cruising. The resulting 180-berth ship will initially replace the Midnatsol on scheduled coastal service for the 2016-17 winter season, as Midnatsol goes off for a season of Antarctic cruising alongside the company’s Fram. Deployment after that has not been announced except that she will not be used to replace the 1964-built Lofoten. The Lofoten herself recently underwent a restoration to return her outfit and interior as much as possible to the original guise, with crew uniforms, menus, and style of service following suit. As an important niche ship in the coastal service fleet her funnel has now been repainted in the original blue, white and black colours of the Vesteralen Steamship Company. 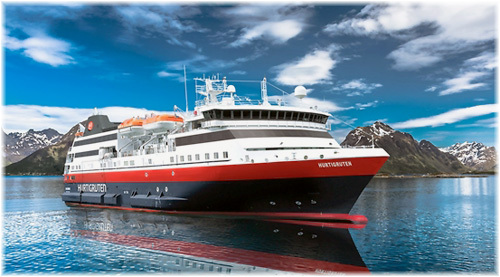 The addition of this new vessel brings the Hurtigruten fleet to thirteen vessels. The 3,341-ton Panamanian-registered Megastar Taurus has been reported as shortly to enter a shipyard in Singapore to be refitted as an upmarket expedition ship for Crystal Cruises. Built by Flender Werft in Lübeck, this ship has had a checkered career over the past twenty-five years and is being acquired from lay-up. Meant to compete with Sea Goddess and Seabourn when built in 1991, Megastar Taurus and sistership Megastar Aries (now known as The Taipan) once formed the ultra-luxury division of Star Cruises. They were purchased by Star Cruises in 1994 for $50 million each after having operated for Classical Cruises as Aurora I & II. The much larger Hapag-Lloyd Cruises’ 1982-built Europa was also meant to become part of this operation but was placed in the Star Cruises fleet instead. 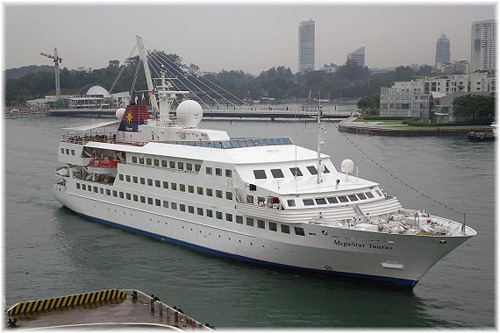 After further sales, she operates today as Saga Sapphire. Meanwhile two if the former 114-berth Renaissance Cruises ships were acquired in 2000 and flipped very quickly to Cruise West and Hebridean Island Cruises. The 270-foot Megastar Taurus has 36 cabins accommodating only 72 passengers so fares will have to be high and product superb. To match this, most of the cabins on the Megastar ships are of a generous 250 sq ft size with a sitting area, refrigerator, desk and, having been built when they were, picture windows rather than balconies. Her marble-accented bathrooms have full-size bath tubs. Cabins on A Deck are slightly smaller, with portholes rather than windows and showers rather than tubs. According to reports, the ship, which will reportedly be equipped with a sightseeing submarine, will be based in the Caribbean towards the end of this year. No announcement has been made by Crystal but the closest to this formula would be that operated by SeaDream Yacht Club with its pair of 112-berth vessels, with whom this new addition will most probably compete. SeaDream has been seeking a third ship of its own for some time.